Contemporary loyalty programs generate power by transforming dreams into action. The Marina Bay Sands hotel pictured above epitomizes the aspirational destinations customers enjoy through participation in a travel loyalty program. Great loyalty programs inspire customers to choose the host company even when less expensive alternatives exist. So when the search for profitable customers drives you to create a loyalty program, here is how to do it right. There isn’t a single recipe, but certain ingredients are known to taste better and every compromise you make to the set of principles outlined here will reduce the number of people you can influence. When applied carefully these principles will improve customer engagement and lead to higher profits and lower costs. Exceptional loyalty programs offer meaningful value. That value is accrued seamlessly without obstacles. Great programs are transparent and customers understand them intuitively; they eliminate friction at every turn. Loyalty is measured by the number of customers you inspire to select you over and over again. Loyal customers spend more than average customers, they do it more frequently, and they’re more likely to stick with you after a bad experience. Your Customer Relationship Management team has segmented your customers thoroughly and you know how much your best customers are worth, and numerous white-papers and empirical research conclude loyal customers are responsible for a disproportionate share of business profits. But how do you inspire customers to remain loyal? More importantly, how do you convert ‘good’ customers to behave more like your most profitable, loyal disciples? To answer those questions and for a thorough understanding of the loyalty space its worth exploring consumer and business loyalty programs including American Airlines’ AAdvantage program, Delta’s Skymiles, the Citibank AAdvantage credit card, Capital One cards, Starwood Preferred Guest for Business, Starbucks Rewards, and a host of business-to-business programs designed to engineer loyalty or drive customer retention. I’ll focus on travel industry programs and a few non-travel schemes. Loyalty programs have spread to include everything from hotels, rental cars, sandwiches, haircuts, oil changes, and home mortgages. Many of the largest programs allow customers to transact with partners on both sides – earn and burn. 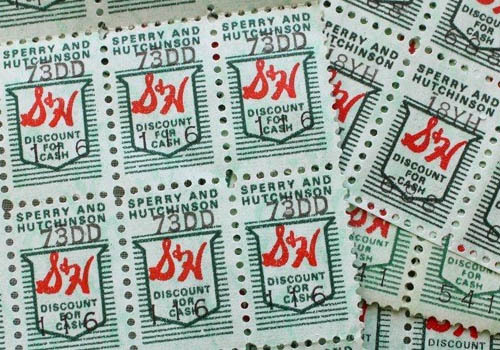 Before Capital One credit cards, AAdvantage Miles and AMEX Rewards Points, companies rewarded consumers with “green stamps” from Sperry and Hutchinson (S&H). Greenstamps were literally stamps awarded to customers at the point of sale for a variety of behaviors. They started in 1896 and continued through the mid 1980’s. Retailers, supermarkets and other retailers purchased “Greenstamps” from S&H to issue to their customers and once the customer accumulated enough stamps they would redeem them for products from an S&H catalog. At their peak in the 1960’s S&H’s reward catalogs were the most widely distributed publication in the United States, while they issued more than three times as many stamps as the US Postal Service. By 1978 competition following deregulation of the airline industry and the widespread use of more powerful computers supported expansions in airlines’ sales and marketing programs. In 1981 American Airlines launched the AAdvantage frequent flyer program (followed closely by United Airlines) and a few years later added a co-branded credit card product with Citibank. The frequent flyer program gave people a chance to accumulate credits quickly, while the Citibank AAdvantage card offered another way for less well-traveled consumers to enjoy the benefits of cheap flights. Throughout its history, American’s AAdvantage program had the highest enrollment and member participation rates among frequent flyer programs and loyalty credit cards. Over the past decade American’s partners have purchased more than $1 billion annually to distribute across 50 million members making AAdvantage one of the most influential contemporary consumer loyalty programs. Mergers have driven Delta’s Skymiles and United’s Mileage Plus programs ahead recently, while global alliances including Oneworld, Skyteam and the Star Alliance expand program reach to customers who may never step foot on a US or European owned aircraft. Airlines operate ‘anchor’ programs that drive scale and reach that few retailers can match (McDonald’s and Starbucks are notable exceptions). The most successful travel programs have powerful, exclusive relationships with consumer banks. Those banking relationships are driving the next wave of business-to-business loyalty programs and the future looks bright. Loyalty programs must be meaningful – the accrued value must be worth managing. Customers must be able to calculate value intuitively. Earning behavior must be easy to describe, easily understood, and programs should give credit for wide-ranging transactions, not just a narrow band of profitable behavior. This is distilled to Simple, Seamless, and Comprehensive. Global Airlines run the largest programs and typically offer a free domestic coach ticket for 25,000 flown miles. An average round trip is 2,500 miles, so travelers generate 10% of the award value from each trip. That’s a good value trade-off. Travelers who also spend $25,000 on an airline credit card have an easy way to earn two award tickets every year. Effective loyalty programs drive customer behavior. They reward profitable behavior – they are structured to generate more frequent, higher value business from program participants. So why doesn’t everyone join your program? A look at the airlines reveals that about 50% of all passengers do not belong to the airline’s program. Customers participate in programs that are personally relevant. The public is inundated with offers to join various programs, but they will not participate unless they’re offered enough value to justify wallet-space. Marginal Airline offers end up in the trash while a favorite restaurant makes the cut by offering a free entrée every tenth trip. Currency choice matters – it must be intuitive and the average customer should be able to calculate the currency’s value and identify the activity or behavior required to earn common awards. Consumers get it when their barber issues a card that requires ten visits to earn a free haircut. Simple, seamless, comprehensive. The earliest airline programs called their currency ‘miles.’ Miles are intuitive – when a traveler flies between New York and Los Angeles – they’ll earn one mile of currency for each mile in the air. That’s 2,472 miles each direction in this example. Miles are the basic building block – they’re analogous to a penny. Once you ‘earn’ 25,000 mile you can redeem them for a free coach ticket (treating miles like pennies is equivalent to $250 value). Loyalty credit cards lean towards ‘Points’ and a typical value is one ‘point’ for every dollar spent. The pure credit card programs often offer travel awards as a redemption option so a currency that converts easily to ‘miles’ makes it simple for most consumers to adopt the ‘point’ system and it gives them confidence about an already well-understood earn and burn structure. In the largest programs points and miles are equivalent and fungible – it’s like a foreign exchange system, you can often trade airline miles for the same number of hotel points. In recent years other airlines, particularly the low cost carriers adopted segment based currencies – Southwest Airlines Rapid Rewards famously offered a free round trip ticket every time a customer flew sixteen segments. It’s easy, but customers could earn a ticket after purchasing just three trips if the routing required double connections (three segments each way). The other end of that spectrum is the customer who bought eight round-trip tickets for non-stop flights before earning the free ticket. Southwest’s program didn’t seem equitable, so Southwest updated Rapid Rewards to issue ‘points’ based on two variables – the type of ticket and the price. Now customers earn six points for every dollar spent on Southwest’s “wanna get away” leisure fares, while it takes 6,000 points to ‘buy’ the same type of ticket. A quick calculation reveals free tickets are available after spending just $1,000. It’s a good system, but it leaves program players shaking their heads to calculate earn and burn values quickly – members need to read their statements carefully. Companies that offer separate programs for consumers and businesses should think twice before they create parallel currency and banking systems for each type of customer. Specifically, many domestic airlines offer consumers mileage-based currency through their frequent flyer program, while offering companies a spend-based, point currency in their business rewards program. A review of award menus at United and American reveals similar awards are offered through each program, but the redundant systems increase costs and management workload. An example on the hotel side can be found in Starwood Preferred Business (SPB) program; SPB is integrated with Starwood’s Preferred Guest program and can be managed in parallel and through the same systems – this arrangement reduces the cost and eliminates currency confusion since both programs payout in similar fashion – the traveler accrues points in their individual program, while their employer accrues points in the Starwood business program. This co-mingling makes it easy on the front-desk staff too and the entire company is aligned with the program messaging. Companies can manipulate value on both sides of the ‘earn and burn’ equation, so consumers need to be familiar with program rules on both sides – the less fine print the better. And don’t neglect cash controls – management often overlooks the cash value of their awards or loyalty currency. Robust controls must be implemented to ensure employees don’t have the ability to give points or awards away without comprehensive tracking and reporting. Give ‘em what they want! If you sell widgets because people value them, it goes without saying that widgets should be on the award menu. In fact, your award menu should include ‘starter’ widgets, widget covers, widget ‘bonus-packs’ all the way to up ‘premium’ widgets. Airline awards begin with highly restricted, long advance purchase, mid-week, domestic, coach tickets, and move up to last-minute, international first-class, around-the-world fares. A collection of ancillary benefits are available too – including lounge passes, upgrades, cash plus program credit, reduced fees and other special awards. All priced in loyalty currency. Hotel award menu’s include rooms, upgrades, all priced in ‘point-based’ currencies tied to spend and room-nights. Another popular option for larger hotel programs allows point transfers into airline miles. Program participation must be simple, seamless, and comprehensive. Loyalty program members should be able to attach their membership numbers or customer identification to their transactions easily. Their purchases should be tied to online profiles or a barcode or a RFID membership card. Companies should take action so members don’t need to remember their member numbers and, if they do need to remember them, companies should create as many opportunities as possible to add the number throughout the purchase or use process. Effective programs make it easy to claim credit long after the purchase. Same rules – simple, seamless, comprehensive. Most common requests – 1. provide ‘earn’ credit; 2. Reset account access; 3. Merge accounts ; 4. Provide enrollment support; 5. Provide redemption support (complicated program rules will drive these requests up). Companies should acknowledge that customers want to communicate in different ways (phone, email, and text) and should offer customer service through common channels. If your program can’t support a live 24/7 operation, at least provide self-help online and find a way to show customers you appreciate their business. Collect the low-hanging fruit – that means a laser focus on your existing customers before you move on to new or potential customers. Advertise your unique value proposition, currency and program rules to your existing customers with your existing marketing and communication channels. As enrollments begin to climb study your data to determine characteristics your most profitable customers share and seek out non-customer populations that exhibit the same qualities or behaviors. Future campaigns should target those potential customers and develop creative A-B test groups to hone your marketing skills and test intuition about your customers. Enrollment offers should include ‘seed’ points or miles to jumpstart member participation. Follow-up campaigns should segment customers in meaningful ways including a group that have earned enough points for basic awards, but have never redeemed points or miles. The possibilities are endless, but a careful approach that combines your industry knowledge with insight about your most profitable customers will yield the best results. Common sense and the desire to limit liability suggest acquisition offers should be richer in competitive markets, and lower where the host has higher market share. Targeted offers and A-B tests may require you to use a promotion code system (one-time use codes are recommended to prevent wide distribution via the Web). Before you get too far down this path it’s instructive to educate yourself about ways promotions can go wrong so here’s a great Website you should spend some time on to avoid making similar mistakes. This is just a glimpse into the loyalty cook book – these programs are important tools to manage the relationship between companies and their best customers. Done well, thoughtful programs can give you an edge and drive bottom-line performance. Use this simple guide to create a solid framework as you invent your own program and embrace ideas from successful programs across multiple industries. Finally, ask yourself why programs and their components work and what conditions exist that drive customers to participate in them? Answer those questions and you’ll understand new ways to achieve better results.